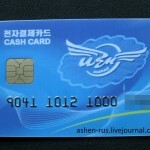 UPDATE 5 (2012-7-3): Some time has passed since Narae’s launch, and Dr. Seliger reports that use of the debit card in Pyongyang is growing. 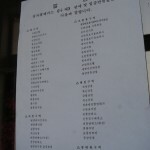 As evidence he sends along a list of Pyongyang establishments that are accepting the card. 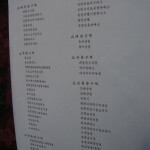 You can see a rough English translation of the names of these shops and hotels here (doc). It is worth pointing out, again, that the Narae card stores balances in hard currency. 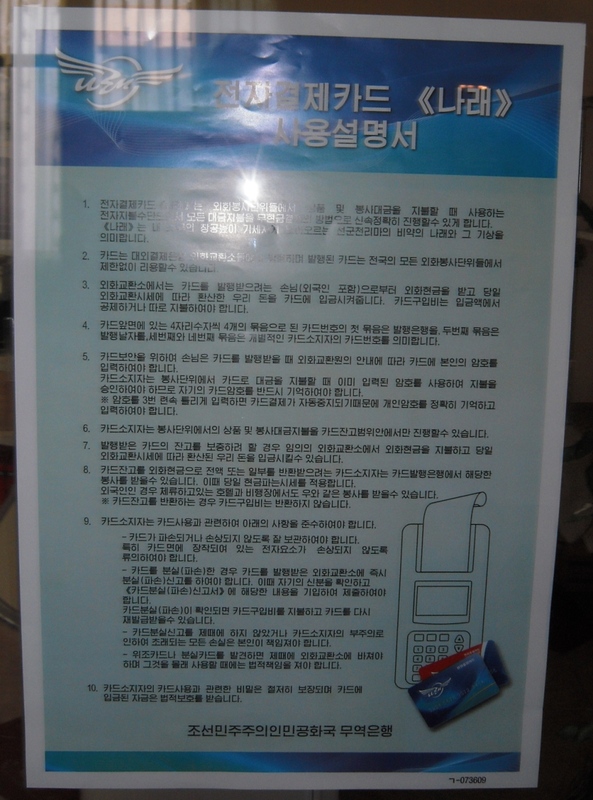 An electronic system for settlement with the use of debit cards has been for the first time introduced at the international communications center, in major department stores, hotels, and restaurants of North Korea. 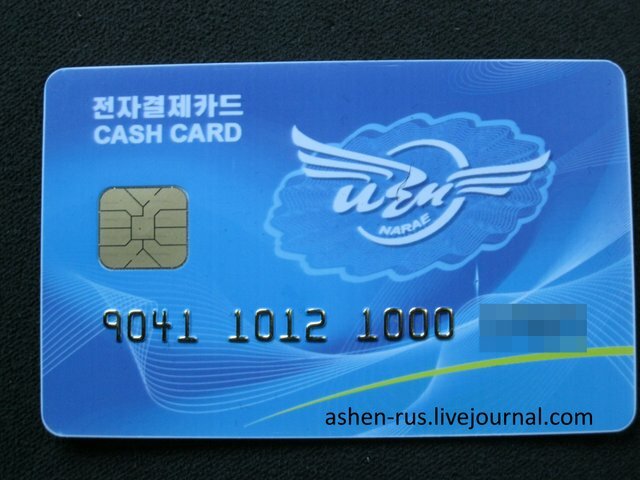 The debit card dubbed Narae (wing), can be used both by the citizens of North Korea and by foreign diplomats and representatives of humanitarian organizations working here, according to Russian news agency Itar-Tass on Tursday. It takes only several minutes to issue the cards to foreigners. The card’s cost is $3. Not more than $1,000 may be placed in an account. 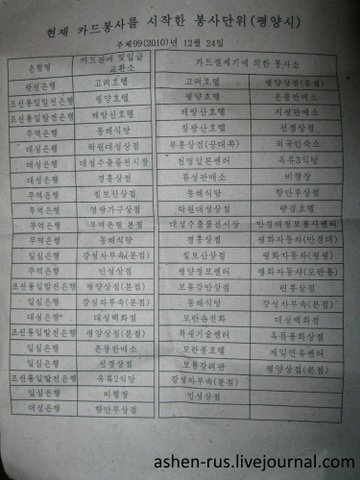 In case of settlement, the money is automatically converted in to the North Korean won in accordance with the official rate of exchange. The card bears an inscription indicating a date of issue, a card number, and a bank code. In the interest of financial safety, a user enters a personal four-digit code of his own. Most foreigners have acquired such cards, pointing out the convenience of using them, first of all because cash register operators in local shops quite often lack small denomination coins to give change to customers who pay cash in US dollars or Euros. This story confused me because there are a couple of notable differences between the official information posted in Pyongyang last January (see ORIGINAL POST below) and the facts laid out in the above article. First, Bernama claims that there is a $1,000 limit to the value that can be prepaid to the Narae card, yet according to the informational flyer posted in the Potonggang Hotel, there is no limit to the balances that can be prepaid. From the Narae issuer’s financial perspective, it does not make sense to apply a limit. Placing a legal limit to prepaid quantities limits the issuers own income. This is because issuers of prepay cards earn interest income (float) on the deposited funds as long as the balances remain on the card (before the ultimate consumer spends the funds). The larger the amount of funds prepaid and the slower they are spent, the more float the issuer earns (we are assuming a monopoly issuer here–competition would reduce these profits if allowed). 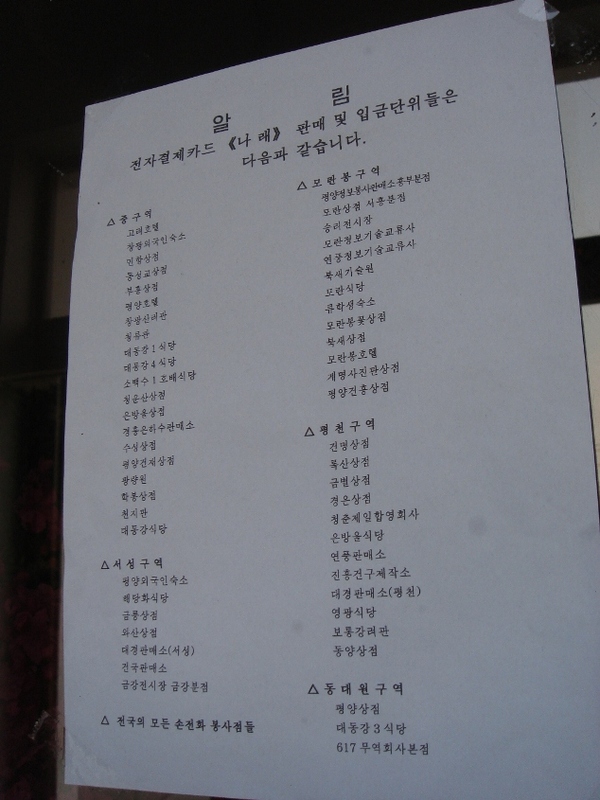 It could be, however, that the issuers are not profiting from interest income earned by floating deposits since Pyongyang does not have a legitimate money market (Though it would not be too difficult to move most of these funds to Singapore or Hong Kong where they could earn interest while keeping a small % in Pyongyang to clear payments each month). This would imply that the electronic payment system is valuable to the regime for control purposes—because it mops up hard currency from the individuals who regularly come into contact with foreign exchange and prevents dollars, yuan, yen, and euros from trickling into the black markets. In this sense, the prepay cards works much in the same way as the old foreign exchange certificates (FECs) did. Remember when the DPRK had three different colored currencies depending on where you were from (Capitalist country, socialist country, or local)? Theoretically, with the new prepay card North Koreans and foreigners could deposit their hard currency when they arrive at a North Korean customs office (airport) and spend the balances in approved locations. The government gets the hard currency, the customer gets the goods, and low-level employees and managers are never tempted to accumulate forex. 1. 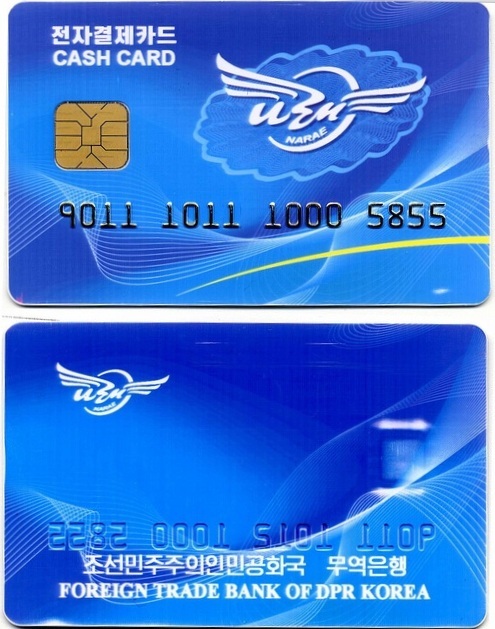 Debit card “Narae” is an electronic payment system used to pay for goods and service in service units where foreign currencies are used. It makes payment process fast and accurate without cash. “Narae” means “wings” and spirits of Songun Cheollima flying fast and high into the homeland’s sky. 2. A card is issued at exchange office of foreign banks and an issued card can be used in service units using foreign currencies without limit. 3. Exchange offices receive foreign cash from guests (including foreigners) and deposit cash into a card according to the exchange rate on that day. Fee for a card itself is paid separately or deducted from money in a card. 4. There are 4 numbers in 4 bundles on the front of card. The first bundle means the bank of issue, the second is the date of issue and the third and fourth bundles means card numbers of the card owner. 5. For security a guest should enter his own pin number under the instruction of clerks. You approve payments using numbers you already entered so you should remember your own pin numbers. *If you enter wrong numbers 3 times consecutively payment process is stopped. 6. You can pay only within your balance in a card. 7. If you want to supplement balance you have to pay cash and it will be exchanged into Korean won at the exchange rate on that day and deposited to your card. 8. If you want to take your cash back you can get this service at bank of issue. The exchange rate on that day is applied. Foreigners can get this service at hotels and airports. *Fee for cards is not returned. 9. You have to follow those things regarding using a card. -You should keep a card well not to be broken or damaged. 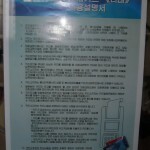 Especially be careful not to damage electronic factor on the card. 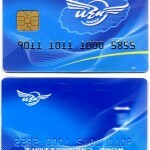 -If a card is damaged or missing you should report it to exchange office. 10. Your confidentiality regarding a card is completely assured and money in your card is protected legally. A PDF of the flyer in English and Korean is here. 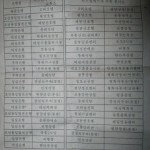 By chance, the Russian blog “Show and Tell Pyongyang” (Translated to English here) also posted some information about Narae. Below is a picture of a Narare card and a list of locations where it is accepted. Click images for larger version. In the chart above, the first column is apparently bank names. The second column is where people can go to buy the card and deposit money. 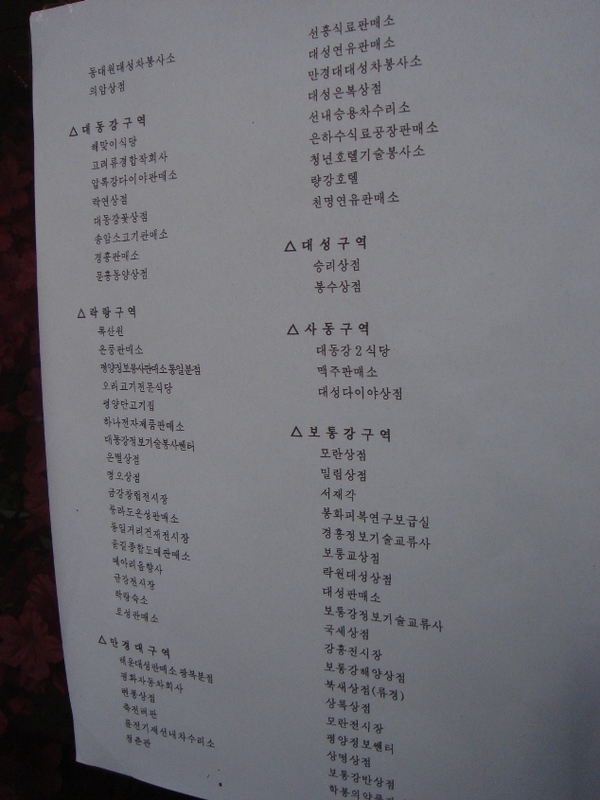 The third and fourth columns are “Current volunteers/volunteered places that have started card service”. Thanks to a friend for the translation. If you recognize any specific institutions on the list, please let me know. This entry was posted on Thursday, March 24th, 2011 at 3:00 pm and is filed under Fiscal & monetary policy, Tourism. You can follow any responses to this entry through the RSS 2.0 feed. Both comments and pings are currently closed.